Finger food can be dessert, too! 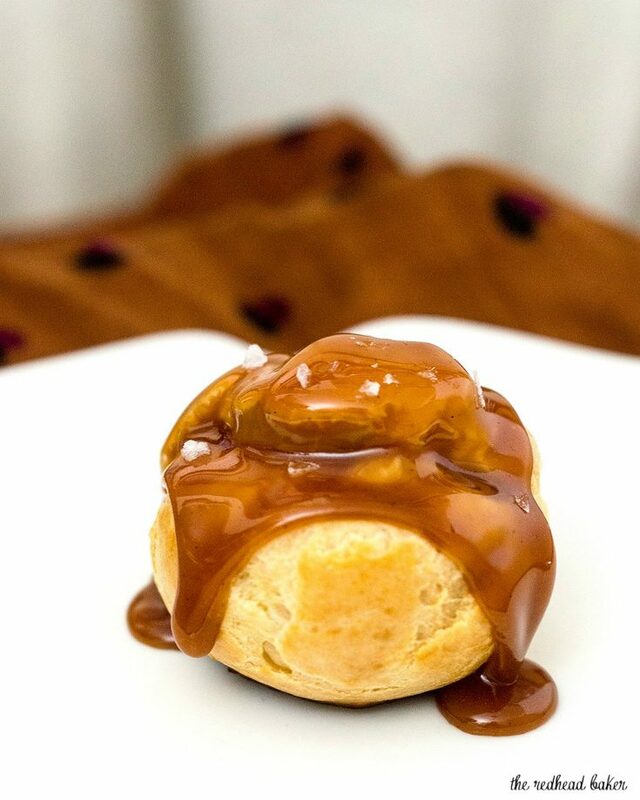 Bite-size salted caramel cream puffs are the perfect balance of salty and sweet flavors. Mmmm, finger food. For some reason, food you eat with your fingers always seems more fun to eat. When trying to think of a dessert you eat with your fingers, my mind first went to cream puffs. Making cream puffs at home isn’t as intimidating as they may seem, technique-wise. It takes a couple of days, and dirties a few pots and pans, but it’s so very worth it. If you make the pastry cream the first day, and the cream puffs the second day, it doesn’t seem as labor-intensive. I suggest making the pastry cream first because it needs at least 4 hours, preferably overnight, to chill. It’s similar to making homemade ice cream, but even easier because the flour helps thicken the custard along with the eggs. 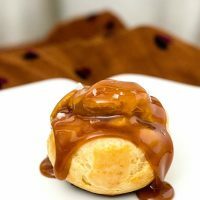 I think the flavor of the salted caramel pastry cream was even better the next day! I’ve included a very easy microwave caramel recipe, but you can use store-bought if you prefer. Mix 3/4 of a cup (6 fl oz) of caramel into the pastry cream, taste, and add more as desired. 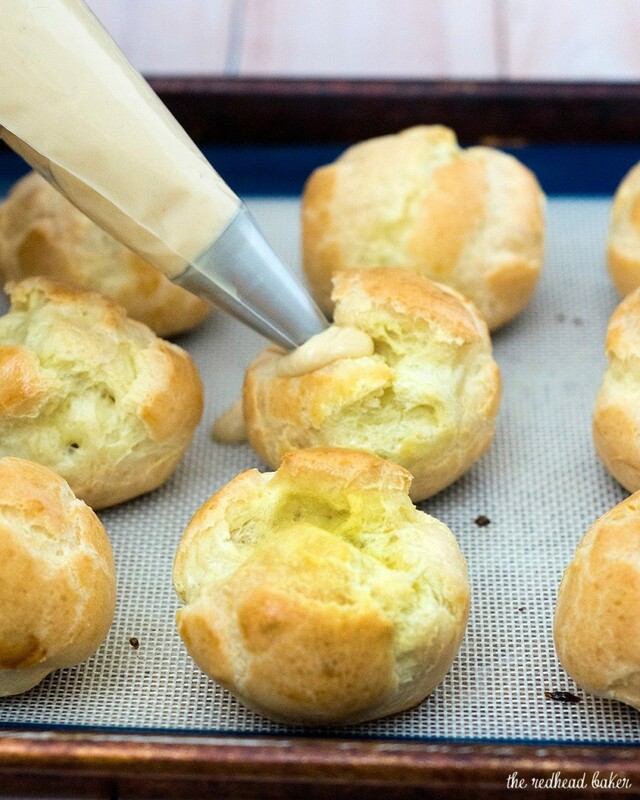 Mixing the cream puff dough doesn’t require any special equipment. Cooking the flour in the saucepan cooks out the raw flour flavor, and begins to dry the dough out, so that one big air bubble forms instead of lots of little ones. It’s important to rest and cool the dough before adding the eggs, so that the hot dough doesn’t cook the eggs in the mixer. The dough will separate as each egg is added, but it will come back together with some mixing. To portion the dough, though, you’ll either need a pastry bag with a plain tip, or a medium cookie scoop. I’ve used both, and actually got better results with the cookie scoop, probably because the scoop makes more uniform puffs. Once your puffs are cooked through, it’s important to pierce a hole in the either the bottom or the side to allow steam to escape. To further dry out your puffs, helping them hold their shape, place them hole-side-up on the baking pan and place the pan in the oven with the heat turned off, and allow them to cool inside the oven. I strongly recommend using a pastry bag and a small round tip to fill the puffs. You need something rather pointy and strong to get through the wall of the puff and get the cream in. Store filled cream puffs in the refrigerator, or in the freezer for up to 3 months in a freezer-safe plastic storage bag. 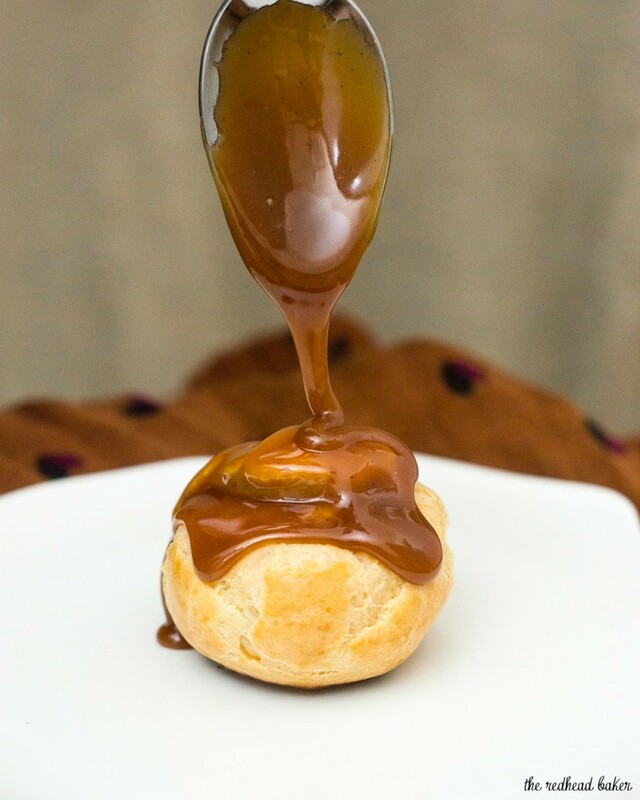 I think the filled puffs are delicious all on their own, but you could top them with chocolate ganache (recipe included below), with caramel sauce, or with a dusting of confectioners sugar. In a 2-cup glass measuring cup, combine the sugar, corn syrup and water. Place in the microwave, and set to cook for 5 minutes on HIGH. Park a chair next to the microwave and keep a close eye on the cup. Seriously, do not walk away. As soon as it starts to turn an amber color (it will go from amber to black very quickly), stop the microwave and with heavy oven mitts, remove the glass from the microwave. In another measuring cup, stir together cream and vanilla extract. Slowly drizzle it into the caramel -- the caramel will bubble up rapidly. Whisk until the cream is fully incorporated. Add the butter, and stir until fully incorporated. Set aside to cool. To make the pastry cream, place the half-and-half in a large, heavy saucepan over medium heat. In a mixing bowl, whisk together the eggs, egg yolk, flour and sugar. Whisk constantly until the mixture is pale yellow and slightly thickened, until the half-and-half starts scalding (little bubbles will form at the edges of the pan). Use a ladle or measuring cup to very slowly drizzle about a quarter of the hot liquid into the egg mixture, then pour all of the egg/half-and-half mixture back into the saucepan. Stir with a wooden spoon for 3 to 5 minutes, until the mixture thickens. Remove from the heat, and stir in the vanilla extract, and about 1/2 a cup of the salted caramel. Pour the pastry cream into a storage container, and press a piece of plastic wrap directly onto the surface. Cool to room temperature, then refrigerate at least 4 hours or overnight, until thoroughly chilled. Make the cream puffs: preheat oven to 425 degrees. With mixer on stir or lowest speed add eggs, 1 at a time, making sure the first egg is completely incorporated before continuing. Spoon the pastry cream into pastry bag fitted with small round tip. 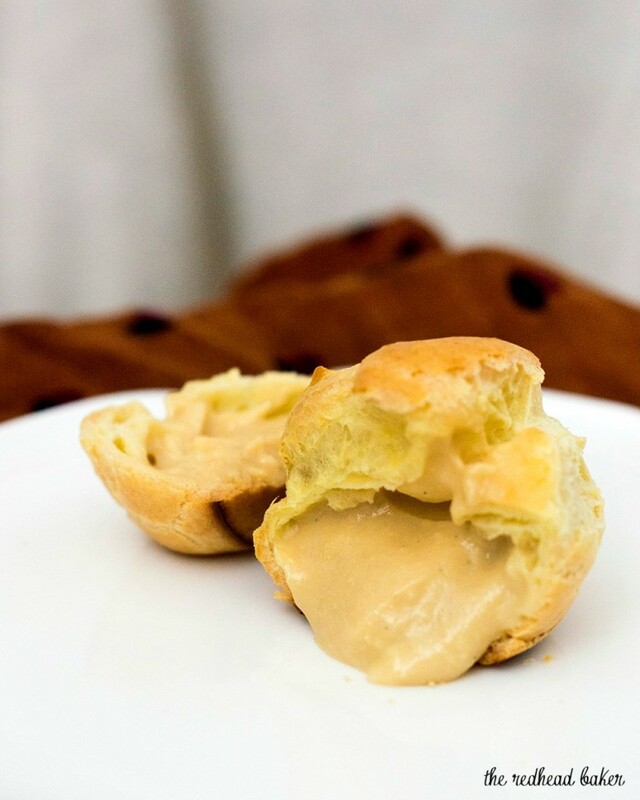 Insert tip into bottom of cream puff and gently squeeze to push cream into pastry. The pastry is full when it feels heavy, and the tip pushes itself out of the pastry. Refrigerate the cream puffs while you make the ganache. Place the cream in a small saucepan over medium heat and bring just to scalding. Pour the cream over the chocolate and let stand for a minute, then whisk until smooth. Dip the tops of the cream puffs into the chocolate ganache, and place on a sheet of parchment or wax paper to let the ganache set. Discover more Finger Food recipes! I need these in my life! This is perfect for me to try as I am trying to improve my pastry skills. These are absolute perfection. I love salted caramel on any dessert. Gorgeous cream puffs! I love the gooey caramel on top! These sound a bit work intensive–but oh so worth it! Okay, yup, I’m drooling. These look so light and cute and delicious and I think I need an entire batch of them in my kitchen, like, yesterday. Cream puffs are on my bucket list. Seriously. Especially with your salted caramel. Super yum!